There are about a million different thermometers out there, which makes it pretty difficult to find the right one. Some are old-school with red liquid inside, and others are thin strips that change color to read your temperature. Then there are countless digital thermometers out there that range in complexity, accuracy, and price. Which one should you choose!? Don’t worry because we’re completely taking the guesswork out of the equation. 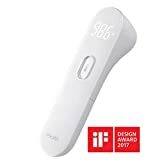 The iHealth Infrared No-Touch Forehead Thermometer is the perfect thermometer for babies, children, and adults. You don’t even need to touch it to the person’s forehead — simply hold it near the forehead, press the one button on the device, and you’re done. An accurate temperature reading is displayed on the screen in less than one second! FDA and Medical CE Approved and meets ASTM E19650-98 performance standards.